Texans looking to cast their ballots on Election Day were met by a series of delays and technical difficulties that resulted in long lines, and in some cases kept voters from casting their ballots. A state district judge has ordered Harris County to extend voting hours at nine polling locations that failed to open on time this morning. The order to keep nine voting locations open an extra hour until 8 p.m. came soon after the Texas Civil Rights Project and the Texas Organizing Project sued the county over delays at those polling places. The groups alleged that the county was violating the Texas Election Code because polling locations that opened after 7 a.m. would not remain open to voters for 12 hours on Election Day as required by state law. In a lawsuit filed Tuesday afternoon, the two groups noted that the nine polling locations across the state's biggest county “not only failed to open at 7 a.m., but remained closed until well after 7 a.m.,” the plaintiffs wrote. Voting was further delayed at some polling locations because of equipment issues, including sign-in and voting machines that weren't working. Early morning voters at those locations faced delays Tuesday morning and, in some cases, were kept from casting ballots before needing to head to work, according to affidavits filed by several Harris County residents. Among them was Jessica Hill, a local teacher who had to get out of line at 7:45 a.m. because she needed to be at work by 8 a.m. Hill had arrived at Marshall Middle School by 6:30 a.m. and was the first person in line to vote. But poll workers were locked out of the building until 6:47 a.m. When they started letting voters in to vote, the sign-in machines were not working. 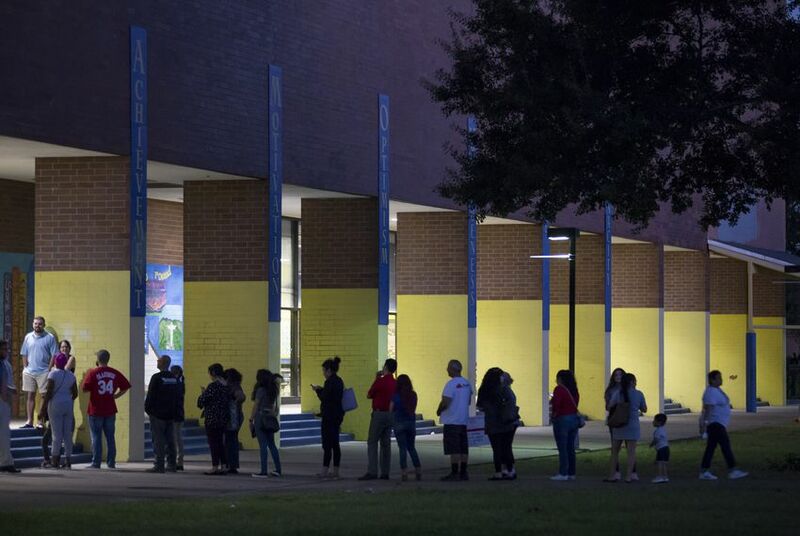 She watched poll workers troubleshoot the machines until leaving at 7:45 a.m.
“Harris County has been a major flashpoint, if you will,” Beth Stevens, voting rights legal director for the Texas Civil Rights Project, said earlier in the day. At least 18 polling locations in Harris County either did not open on time or were only partially open on time, with some locations at first operating with one or two machines when they were supposed to have eight or even 16, Stevens said. Those sorts of issues are “typical of start-up issues on Election Day,” said Hector de Leon, director of communications and voter outreach for the Harris County Clerk's Office. He said the county has technicians stationed across the county so they can get to voting locations within 10 minutes of a technical distress call and get machines up and running. His comments came before the lawsuit was filed. Harris County officials couldn't immediately be reached for comment on the suit. Beyond violating the Texas Election Code, the delayed openings of polling locations and the county’s failure to provide functional equipment at those polling locations also amount to a violation of the 14th Amendment, the plaintiffs argue. “The right to vote is a fundamental constitutional right, protected under the Equal Protection Clause from undue burden,” they wrote in the lawsuit. But the county’s practice of late openings “effectively treats plaintiffs and voters in the precinct at issue differently from voters from other precincts within Harris County and around the state, who benefitted from polling locations offering 12 hours of open polls on Election Day,” they argued. That start-up issues in Harris County — which turned solidly blue in 2016 after a streak of thin electoral margins — have become “part and parcel” of Election Day is troubling to civil rights advocates. Among the Texas Civil Rights Project’s chief concerns was that Texans who faced delays and were unable to cast their ballots in the voting window before work would not be able to return before polls closed at 7 p.m.
Extended voting hours in Harris County — home to 2.3 million registered voters — will also delay the release of early voting results for the county until 8 p.m.